An ORCID is a unique identifier number, which is assigned to an academic author and they keep throughout their career. ORCIDs are international and every academic in the world will have a different number. They overcome the issue of an academic changing their name or having a similar name to other academics, which ensures they receive attribution and proper credit for their work. ORCIDs are fast becoming the international standard for identifying academic authors, and they are increasingly a requirement for funders and publishers. Research England have asked that all UK universities report academics' ORCIDs as part of the next REF submission. They potentially enable greater connectivity between systems and the ORCID website provides a central registry of these unique identifier numbers. The University is asking all research-active staff to create an ORCiD account and link it to Pure. New for June 2018 - both of the above options now allow the publications you add to Pure to be automatically added to your page on the ORCID website (not vise-versa). This is useful because it links your ORCID to older publications that you published before you got your ORCID number. 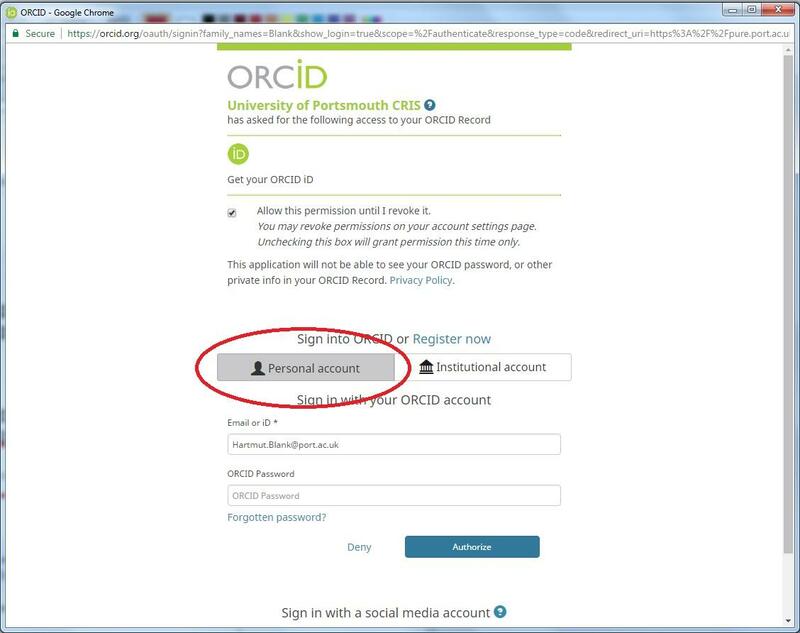 (If you've already connected your ORCID to Pure before June 2018, to enable this facility you need to log into Pure, click the Personal tab, click Edit Profile button, then click the 'Authorise export of content to ORCID' button). Once you have an ORCID, you can provide it to funders and publishers when you submit your research articles for publication and apply for grants. ORCIDs are 'owned' by an external global organisation, which does not allow universities to set them up for members of staff. The instructions below cover the key methods for UoP researchers; however, if you need further help then the ORCID help pages are useful. 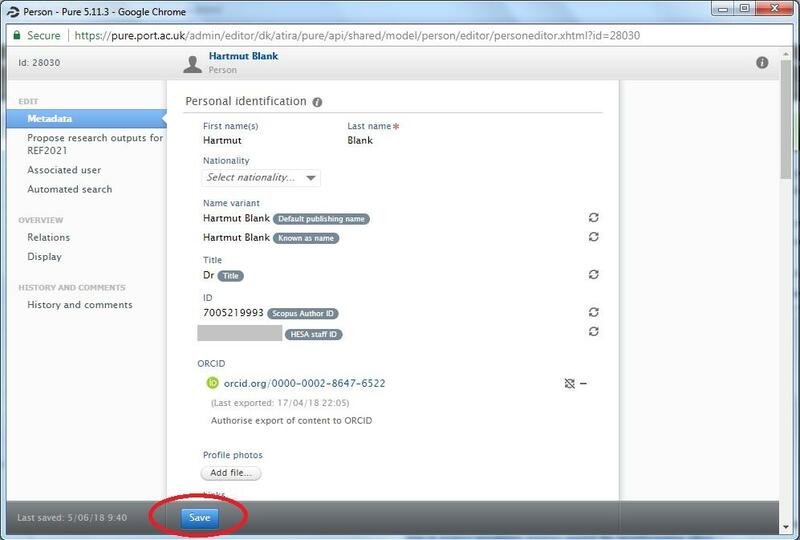 Click the Create or Connect your ORCID ID button (see below). When asked for your email address, please add both your work email address and a secondary personal one. 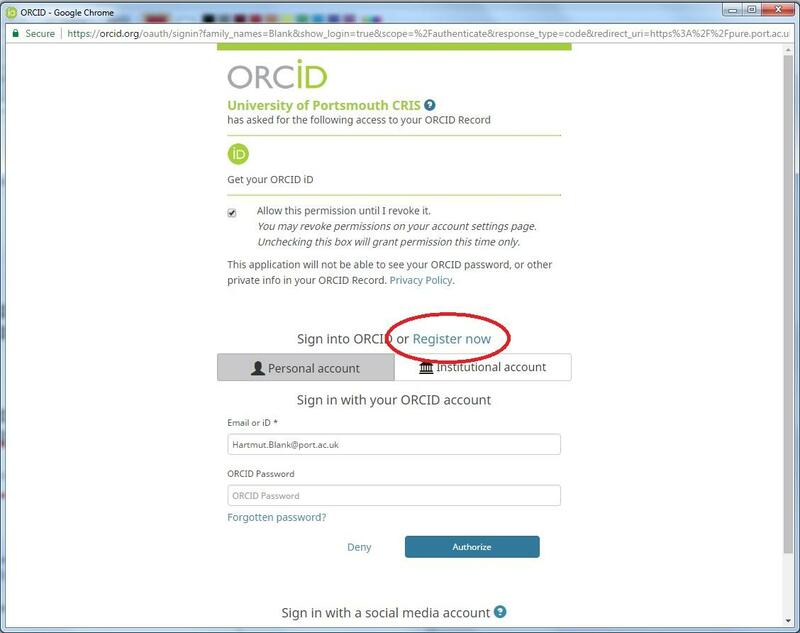 This ensures that you'll still be able to access your ORCID if you move to another University. You ORCID will be added to your older publications overnight. So this will not be visible until the next day. Then press Save on your profile in Pure (see below). 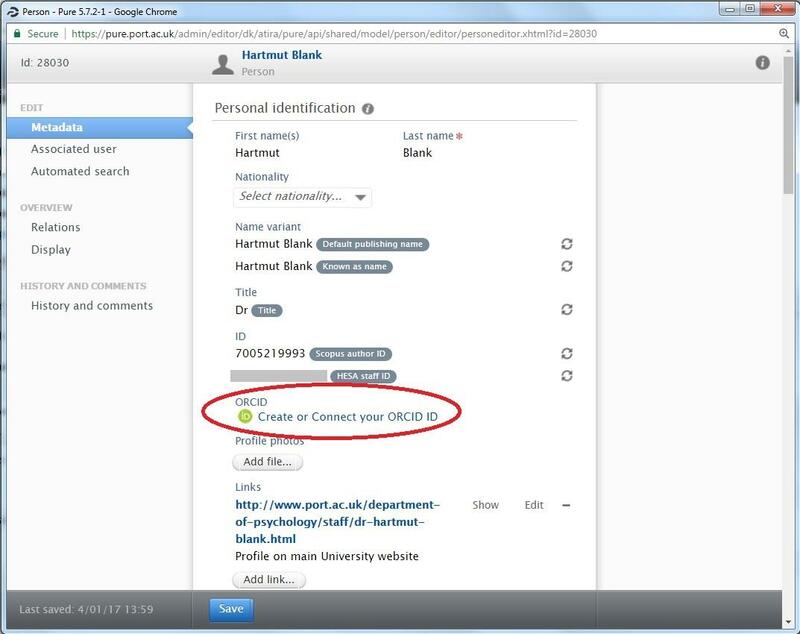 Your ORCID will also be visible on your profile page on the Research Portal. Then click the 'Personal account' button (see below) and follow the instructions on screen.